After ten days of horrible coughing and next-to-no sleep I’m finally on the mend. In my journal I’ve taken to calling this the “asthma attack aftermath”. There isn’t much written for those of us suffering with adult onset asthma but the first of the three books I ordered has arrived. Several kind friends in the blog world have offered suggestions and shared their experiences of living with asthma. It helps immensely. A new daily inhaler arrived (costly little buggers) and it too has helped. The elephant sitting on my chest has left. Now what remains is the coughing. I’ve discovered (with thanks to my good friend Jan at Hungry Holler) that popsicles are medicinal. We’ve gone through about three dozen so far, although I think Chris is eating them purely for pleasure. A popsicle – be it grape, cherry, or orange – calms my throat and decreases the coughing spasms like nothing else. It beats the dickens out of Robotussin and I’m not even talking about taste. Last night was the first night of decent sleep I’ve gotten since the attack began. Decent is what I’m calling four hours of sitting-up-in-the-chair sleep and an added bonus of two hours of morning sleep in the bed propped on two pillows. I feel like a new woman and the bags under my eyes look less like steamer trunks and more like my Aunt Nita’s carpet bag purse. I’m good with that improvement! Thursday I was told to take the whole day off. I wouldn’t say it was ordered but there was scolding involved. I was so exhausted I did as told. With the help of popsicles to calm my cough, I managed to get quite a bit of knitting done on my Emily Dickinson Shawl. (You thought I’d forgotten this is a knitting blog didn’t you?) I’m now well into the third chart and still loving this project despite the miles and miles of garter stitch. The copper lined beads rest beautifully in the chestnut silk. I wish I could get a decent photo (and I’ve tried!) but that will have to wait until it’s off the needles and Chris pulls out his camera. My point and click doesn’t do justice to the beads. Just doesn’t, but here’s a little look-see. I’m hoping to bind off Sunday and get it blocked before we leave town on Tuesday morning. How much knitting time I’ll get between now and then is questionable. We’re gearing up for our first trek to the Amish Acres Festival in Nappannee, Indiana. Four days in a beautiful historic setting chocked full of craftspeople! We’re taking the lavender products and as much merino and silk as we can pack in the van. Since we’ll be camping onsite and not staying in a hotel there won’t be anywhere to block Emily if I finish it while driving over. So I’ve lined up two projects to take with me. My Nutkin socks, because we all know socks are good travel knitting and I’m in need of more fall socks. If you haven’t tried Tempted sock yarn – you should. Not only are Stacy’s colorways fabulous but the twist of the yarn perfect for socks. I’ve knit with plenty of sock yarn and I think Tempted is hands down my favorite – even over BMFA’s Socks That Rock. Really! ra. My point and click doesn’t do justice to the beads. Just doesn’t but here’s a little look-see.I’m hoping to bind off Sunday and get it blocked before we leave town on Tuesday morning. How much knitting time I’ll get between now and then is questionable. We’re gearing up for our first trek to the Amish Acres Festival in Nappannee, Indiana. Four days in a beautiful historic setting chocked full of craftspeople! We’re taking the lavender products and as much merino and silk as I can pack in the van. Since we’ll be camping onsite and not staying in a hotel there won’t be anywhere to block Emily if I finish it while driving over. So I’ve lined up two projects to take with me. My Nutkin socks, because we all know socks are good travel knitting and I’m in need of more fall socks. If you haven’t tried Tempted sock yarn – you should. Not only are Stacy’s colorways fabulous but the twist of the yarn perfect for socks. I’ve knit with plenty of sock yarn and I think Tempted is hands down my favorite – even over Socks That Rock. Really! The next lace project is the Brandywine Shawl by Rosemary Hill aka Romi. Romi’s designs are always intriguing. 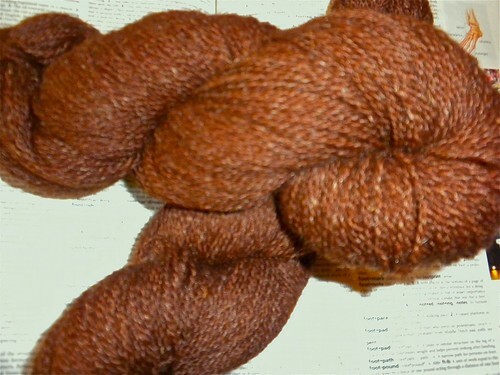 For Brandywine I’ve chosen one of my Oklahoma Fiber Partnership yarns – a rich brown alpaca spun with 20% tussah silk. (the rest of the alpaca/silk – mostly white – will be dyed and available at the farmers market soon). It’s incredible – soft to the touch, a little bounce, and glorious natural color. 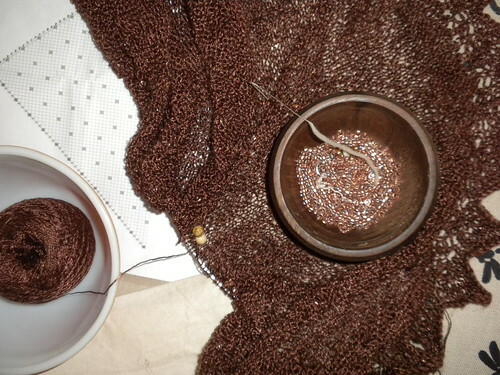 I only bought a tiny bit of this fleece and spinning it resulted in only two skeins of the brown. But while I was cleaning it I knew I had to claim at least one skein for myself. I think Brandywine will be perfect. PreviousPrevious post:I've got it bad.NextNext post:Nappanee bound!